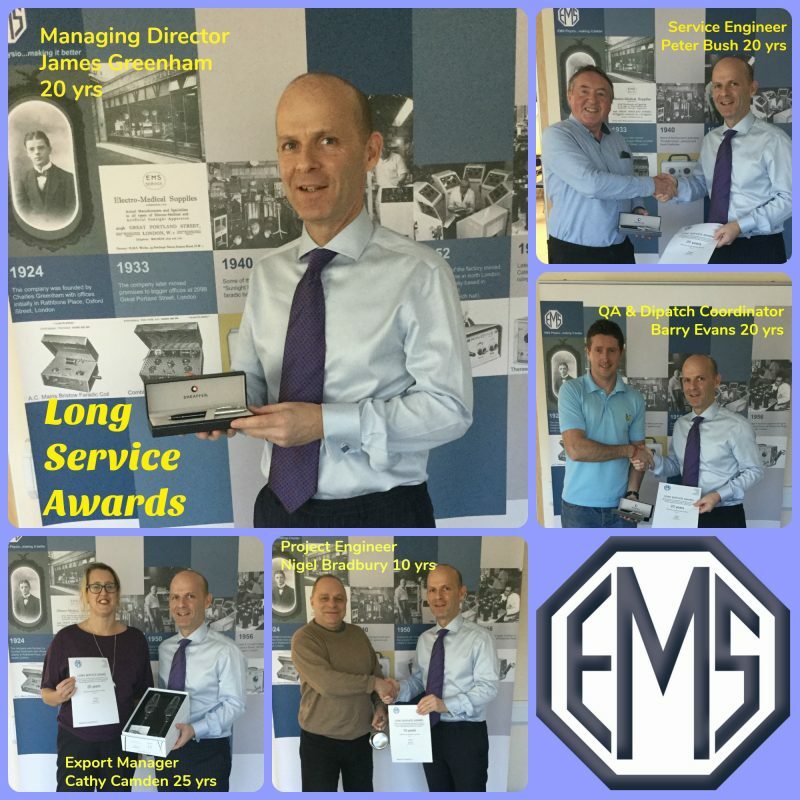 As is with tradition at this time of year any team member with a service year ending in a 0 or a 5 after 10 years is awarded a long service gift along with a warm handshake from the Managing Director which this year proved to be a little tricky as the Managing Director James Greenham himself was recognised for leading EMS Physio for the last 20 years! Mike Bowles, Operations Director, stepped in with a gift and a handshake so that James didn’t feel as if it was a moment lost! From the top Ian Barnes (not pictured), a test engineer with EMS Physio, has notched up 40 years with the Company! Our very popular Miss Cathy Camden was awarded for her 25 years of service to EMS PHYSIO. Along with the world distributors, James thanked Cathy for growing with the Company and her contributions to the development of export sales. 10 years of service recognised for Nigel Bradbury our Project Engineer and Gus Gilbert (not pictured) a test engineer. It is testament to the Company that so many people have stayed the distance and served the Company as it has grown into one of the leading manufacturers of medical devices in the United Kingdom.